Video of brutal bear killing banned in Russia | Russian Legal Information Agency (RAPSI). 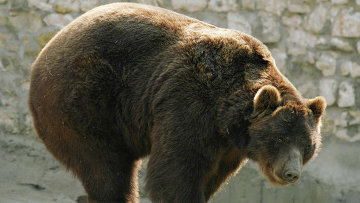 ST. PETERSBURG, August 11 (RAPSI, Mikhail Telekhov) – A Russian court order to ban the distribution of video showing the brutal killing of a bear in Siberia has taken effect, the St. Petersburg prosecutor’s office told RAPSI on Friday. The lawsuit to prohibit the video was filed by a prosecutor following the monitoring of Internet resources. It discords with the principles of moral and humanism, adversely affects moral, intellectual, and mental development of people, including minors, by being an open possibility of animal abuse, the prosecutor’s claim reads. In December, a shocking video showing people driving on trucks over a bear allegedly in Yakutia became available online. According to investigation, the Ural off-road trucks used for killing the animal are owned by a company engaged in works connected with studies of subsurface resources and mineral reserves replacement in the Republic of Sakha (Yakutia). The crime was allegedly committed by rotation workers of one of the republic’s regions. A criminal case has been opened over cruelty to an animal committed by group of persons with the use of sadistic methods and resulted in its death. Investigation is underway. 10:58 11/08/2017 A Russian court order to ban the distribution of video showing the brutal killing of a bear in Siberia has taken effect.